A new generic that pharmacists can automatically substitute for Mylan's EpiPen will soon be on the market. The devices enable people to automatically inject the hormone epinephrine into the thigh when experiencing potentially life-threatening allergic reactions to bee stings, peanuts, drugs or other substances. The EpiPen, which is made by Mylan, has sparked controversy because of its price. It can cost as much as $600 for a package of two pens, and the pens have to be replaced periodically. There have also been periodic shortages of the devices reported around the country. The FDA says the approval of the new products should help with both cost and availability. "Today's approval of the first generic version of the most-widely prescribed epinephrine auto-injector in the U.S. is part of our longstanding commitment to advance access to lower cost, safe and effective generic alternatives," FDA Commissioner Scott Gottlieb said in a statement announcing the approval. 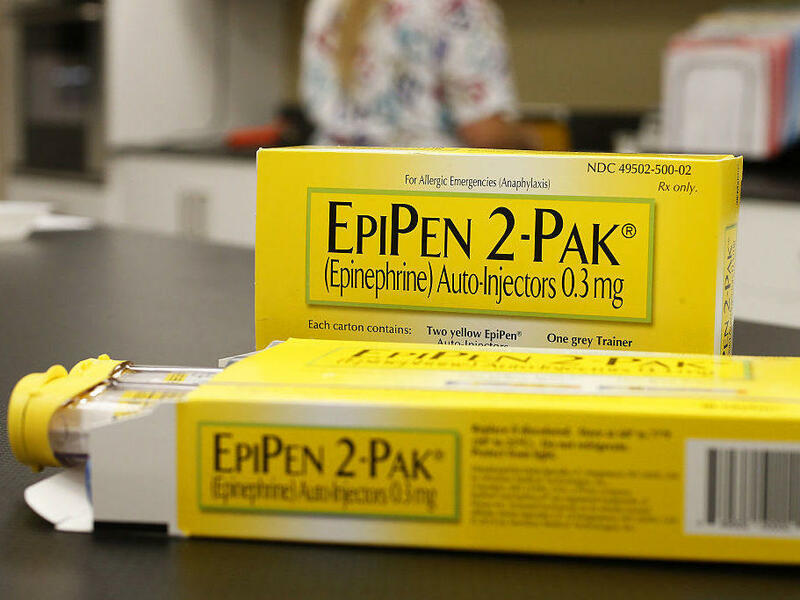 "This approval means patients living with severe allergies who require constant access to life-saving epinephrine should have a lower-cost option, as well as another approved product to help protect against potential shortages," Gottlieb said. Teva has not said how much it plans to charge. In a statement, the company said the firm is "applying our full resources to this important launch in the coming months and [is] eager to begin supplying the market." In 2016, Mylan released its own generic version of the EpiPen costing roughly half the original price. But today's approval is the first from a competitor that is a true "therapeutic equivalent," according to the FDA. Although other generic versions of epinephrine auto-injectors have been previously approved, the new product is the first that can be easily substituted for customers by their pharmacists. "Patients should feel confident that this product will work just as well a brand-name EpiPen," says Dr. Aaron Kesselheim, at Brigham and Women's Hospital in Boston. But how much money will it save? It's too soon to say. Kesselheim's research finds that generics don't necessarily drive down prices dramatically. "It isn't until you get more like four or five interchangeable generics on the market that prices fall by 50 percent or more," he says. "But, again, that's just an average number, so we'll see in this case." Still, Kesselheim says generic competition is the best way to drive down prices in the U.S. market. Richard Harris contributed to this report.